Corner desks are a great option for anyone needing a desk that won't take up too much space. Corner desks can be small computer desks or large L shaped desks that can fit in the corner of your home or executive office. 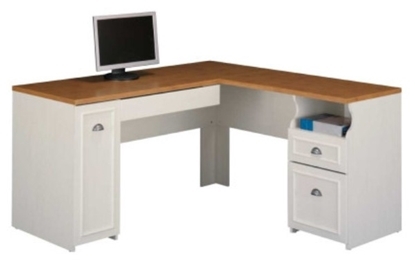 Corner desks may come with or without attached filing and storage options depending on the amount of storage you need. Combining traditional and contemporary functionality, the Bush Fairview L shaped desk has a casual cottage style which would provide a comfortable addition to any home office or business. Perfect for a laptop computer, desktop or tablet. 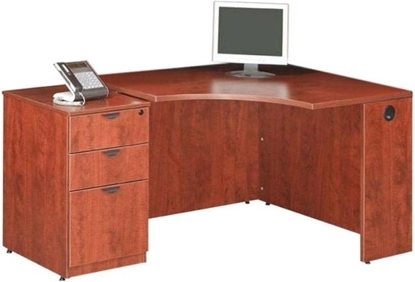 Get free shipping on all discount desks! Combining traditional detail and contemporary functionality, the Bush Fairview White L Shaped Office Desk with natural cherry wood top has a casual style which would provide a comfortable addition to any home office. Perfect for a home office or personal work space. Get free shipping when you order today! 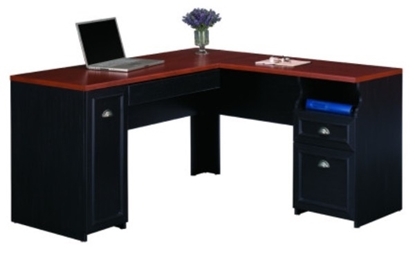 The Bestar Hampton L shaped corner computer desk is a perfect addition to your home office. This corner workstation is designed to give you maximum work space while helping you get organized. Durable laminate sand granite and charcoal melamine finish resists scratches, stains, and burns. Order today and get free shipping! A simple solution to adding work space to a small area. This corner desk has a small frame that allows it to fit where most desks will not and it comes with a mobile pedestal that can be placed anywhere you have space for it. 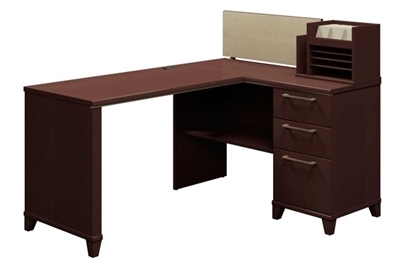 Featuring a built in USB hub and high quality full extension ball-bearing sliding drawers the Bush Enterprise collection provides contemporary styled commercial grade office furniture at a discount furniture price. Perfect for the home or office. Order now and get free shipping! A great way to fit a desk in a small space. 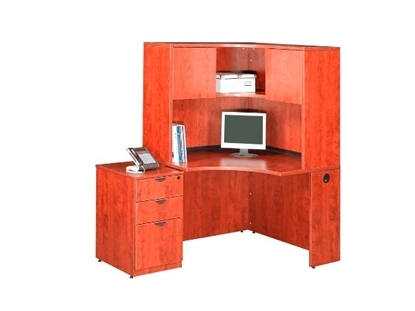 This corner desk includes a hutch for extra storage and a mobile pedestal that you can place anywhere you have space.